During the month of December 2018, four Republican women Kansas legislators -- all from suburban Johnson County -- switched their party affiliations from Republican to Democratic. Johnson County is quintessential suburbia. 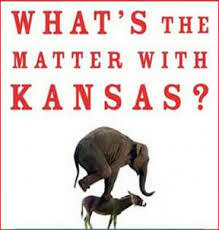 Some 20% of all Kansans live there, mainly in big houses with well kept lawns. A majority have a college degree. They voted for Mitt Romney over Barack Obama in 2012 by 17 points, but Twitterman carried the county by only 3 points over Hillary in 2016. The county is in the 3rd Congressional District, which was flipped red-to-blue by Congresswoman Sharice Davids, one of only two native Americans now in Congress and the state's first openly gay representative. That's especially interesting, because as of the election last fall, Johnson County was majority Republican, by some 75,000 voters. Yes, DJT is doing wonders for the Republican Party! No doubt about it.